In any natural garden setting humans are not the only beings working, eating and traveling through. Insects, birds, small animals, microbes and more are consistently present. To successfully grow a garden without the use of chemical pesticides is to recognize which organisms may cause enough damage to your plants that your interference may be required. And when that interference is required, what might that look like? In trying to take control and dominate in a garden we may in turn hurt creatures and organisms that are peacefully living there and not doing harm. They may even be helping our garden, like in the case of earthworms. If we try to isolate a bug or insect we see as a pest and deal with it separately out of relation to the ecosystem in which it lives, we work against nature. Students in the Green LIONS Garden Group learned all about common creatures we may find in our school garden and which ones may be friends and which ones foes. 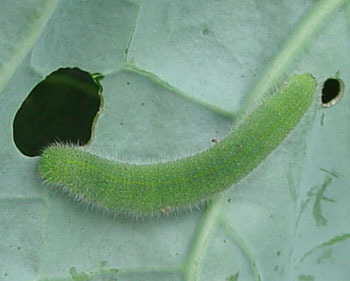 A common visitor and voracious eater we see on fall and spring plants is a cabbage worm. These are the caterpillars of the cabbage moth which are the delicate white butterflies we frequently see flitting about the garden. 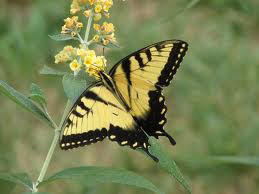 They lay their eggs on plants of the Brassicas family and once the eggs hatch the caterpillars get busy eating. You can easily determine if cabbage worms are present from leaf damage to the plants and their droppings which are frequently seen in the center of the plant. 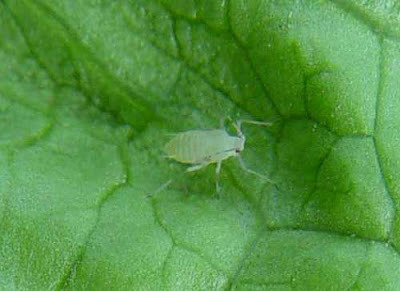 Another common and unwelcome visitor is the tiny aphid. These insects live in clusters and may feed on many different types of plants. 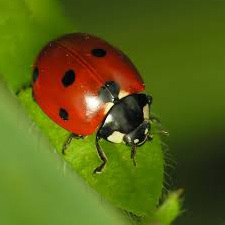 But if you see the vibrant ladybug in your garden too then you can rest assured that the aphids will be kept in check. Aphids are like candy to a ladybug. If you have an out of control aphid problem you can even purchase live ladybugs to release into your garden. They are very effective aphid disposal machines. The praying mantis is another welcome garden inhabitant. And like the ladybugs a gardener can purchase praying mantises for her garden in the form of praying mantis eggs. 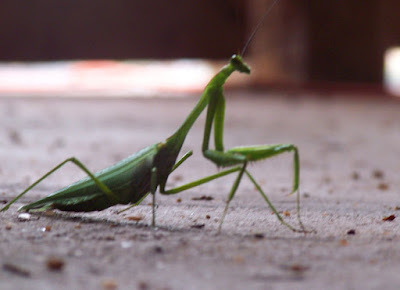 Praying mantises like to eat many different kinds of insects including many pests in the garden. It is exciting to find the presence of a this elegant insect in any garden. important pollinators, they also leave behind their eggs. Once their eggs hatch the caterpillars on members of the carrot family, including green carrot tops, dill, fennel, chervil and parsley. If a gardener is simply aware of this and monitors the caterpillars’ “portion control” these caterpillars can be fun to observe without eating too much of our plants. This one is mostly a friend, but in large amounts may be foe-ish. When we choose not to use chemicals on the plants that we will eat, it makes sense to also reduce the amount of chemicals we put on our skin. 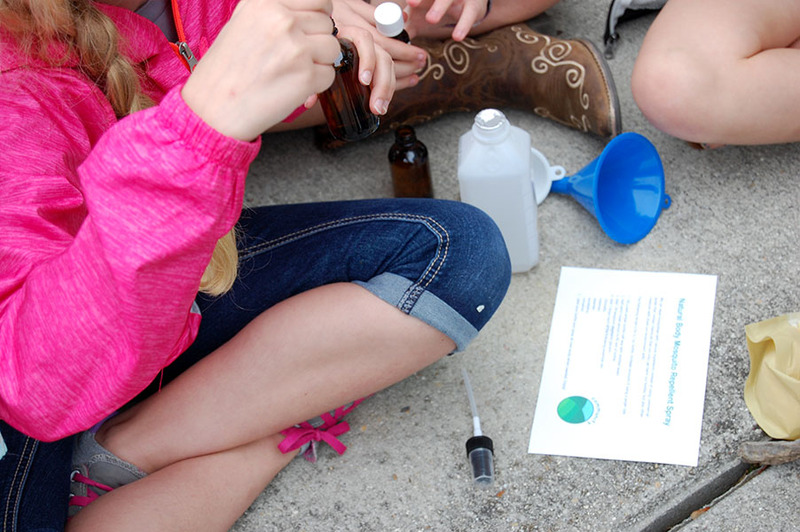 Students learned a simple recipe for a natural mosquito repellent to use throughout mosquito season. By mixing filtered water with witch hazel and essential oils they made a spray that not only smells nice, but will not harm them or the creatures in their environment. This recipe is for a 2 ounce bottle. Increase amounts if using a larger container. It is important to use an amber or dark bottle to protect the oils in the spray from UV light. Fill the bottle half way with water and then fill the rest of the bottle almost to the top with witch hazel. Add 1/8 teaspoon vegetable glycerin. Add 3 drops each of each essential oil. 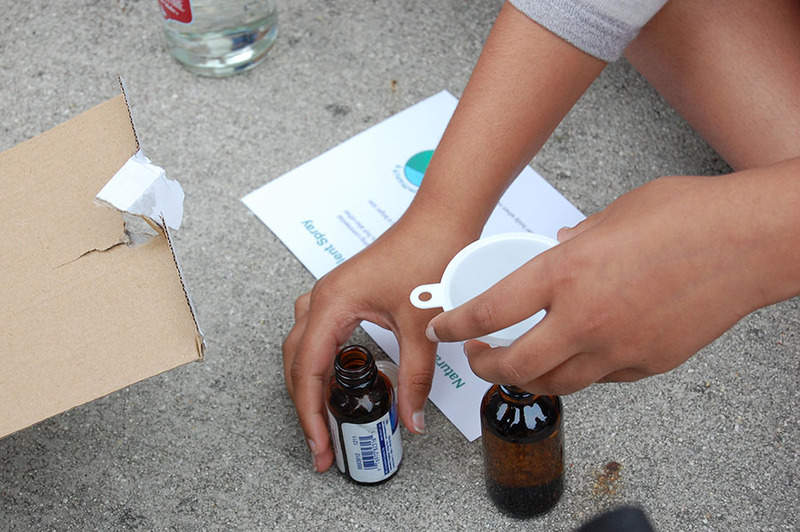 Label your bottle, attach your sprayer, and enjoy being mosquito bite free.